Many Dominican families live in deteriorating shacks with leaky roofs, leaning walls and dirt floors. A simple rainstorm could ruin their homes beyond repair. Compassionate Catholic leaders want to rescue these poor families out of their deplorable living conditions. 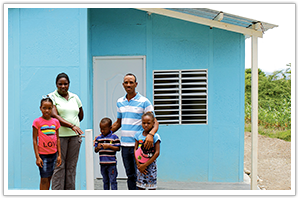 Your generous gift will help them construct durable houses, built to withstand the tropical storms and hurricanes which frequently plague the region. It will also bring families into contact with local priests, who encourage them to build their lives on Christ. Click here for more info or donate now now below.